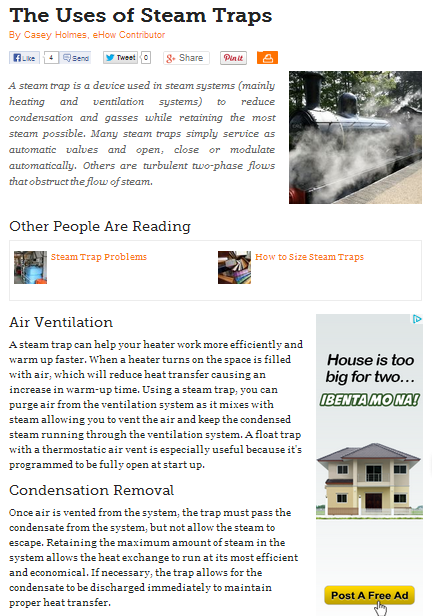 Once air is vented from the system, the trap must pass the condensate from the system, but not allow the steam to escape. Retaining the maximum amount of steam in the system allows the heat exchange to run at its most efficient and economical. If necessary, the trap allows for the condensate to be discharged immediately to maintain proper heat transfer. Steam traps come in different types, each fitting with certain types of fluid or piping system. They usually come with auxiliaries like regulating valves and vacuum breakers to support their operation. The ability of a steam trap to separate condensate from steam and allow it to flow into the vent and direct the steam into the system allows for more efficient production of mechanical energy. Steam traps are also designed with appropriately-sized orifices to control condensate discharge. Discharging the condensate at a lowest possible temperature may seem attractive, but the condensation could end up water-logging the system. Water-logging is the main source of inefficiency and corrosion in a steam system. The right steam trap will allow you to avoid this problem while ensuring your system is running at its best. Aside from steam─ a portion of which eventually turns into condensate─ non-condensible gases also exists in the system. Like condensate, these gases have to be discharged to provide sufficient useful space for steam, and therefore increases the system’s efficiency. Steam traps that are manufactured by reliable companies like MEPCO and supplied to consumers by industry giants like A.L.B. Industrial Supplies, Inc. are extremely efficient. The main purpose of a steam engine is to transform steam into mechanical energy, which in turn becomes electrical energy that powers machinery. Sturdy MEPCO traps are just the component needed to make this happen with the least wastage. Additionally, they can prevent explosions associated with uncontrolled fluid flow in the pipes.